In lieu of sweat glands, elephants, the largest of Earth's terrestrial animals, rely on other physical and behavioral adaptations to keep their massive bodies from overheating. Cooling mechanisms are particularly essential, and therefore more pronounced, in African savanna elephants, the most corpulent of the three living elephant species. They have to contend with hotter, dryer conditions than the African forest elephant and the endangered, jungle-dwelling Asian elephant. An elephant's primary cooling system is a pair of conspicuous ears that account for one-sixth of the animal's body size. The African savanna species can reach heights of up to 13 feet at the shoulder, which makes for very large ears. By merely flapping their ears, elephants can reduce their body temperature by 10 degrees Fahrenheit or more. Air permeates the thin skin of the elephant's ears, thereby cooling blood as it passes though a web of vessels inside the ears before returning to the body. Elephants often spread their ears and face the wind to magnify this effect. 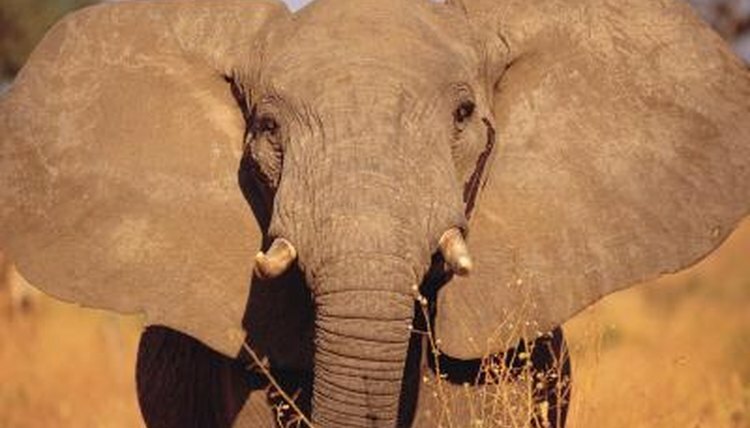 Of the three species, African savanna elephants have the largest ears, which are shaped like their home continent, followed by African forest elephants and Asian elephants, whose ears are more rounded. The wrinkles in an elephant's mostly hairless skin help keep the animal cool by giving heat a larger surface area through which it can be dispelled. The creases and pleats in the hide of an elephant also trap and retain moisture longer than would smooth skin and prolong the evaporation process, allowing the animal to release up to 75 percent of her body heat. Because they live in regions where temperatures can reach 120 degrees Fahrenheit during the day, the skin of African elephants is significantly more wrinkled than that of their Asian relatives. When the daytime heat gets to be too much, elephants enjoy submerging their bodies in water, as well as showering, which entails sucking water with their versatile, muscular trunks and then spraying themselves. In addition to helping elephants rid their thick skin of parasites, bathing is also an effective way for these enormous animals to reduce their body temperature. Thanks to their moisture-retaining wrinkled skin, the cooling effect of a bath or shower remains even after the elephant has left the water. Elephants are largely crepuscular, meaning they are most active at dawn and at twilight, when the sun is lower in the sky and temperatures are cooler. Moreover, using his trunk, which functions as a nose, in conjunction with a special gland known as the Jacobson’s organ that is attached to the roof of the mouth, an elephant can detect water sources up to 12 miles away. This ability is especially crucial in the dry season. Can Beavers Hear Under Water?